The Rockefeller Foundation’s recently launched YieldWise Initiative brings together the often disjointed efforts of the public, private, and non-profit sectors at different points of the supply chain into a cohesive, targeted suite of interventions designed to reduce post-harvest losses. As part of this effort, the Rockefeller Foundation sought to better understand key linkages between land rights and proj- ect outcomes, namely: (1) whether and how land rights for Kenya’s mango farmers a ect project uptake and success; and (2) what (if any) are this project’s unintended consequences on land tenure in implementation areas. The paper begins with an introduction overviewing the YieldWise Initiative, including an articulation of why it is important to consider land issues within the context of agricultur- al investment programming like YieldWise. This is followed by an outline of the research methodology used for assessing land issues related to YieldWise in Kenya’s mango value chain. 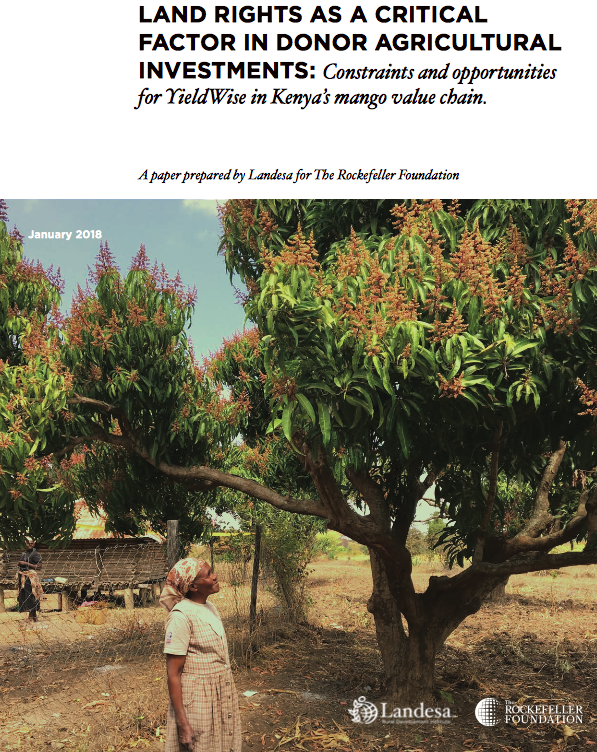 The authors then provide a high-level overview of the land tenure situation concerning Kenyan mango farmers and highlight six issues for the project to consider moving forward. For each issue, the authors make recommendations, specifying whether these are best taken up by the Rockefeller Foundation, project implementers, or the Government of Kenya.